Pranayama is the system of yogic breath exercise. Respiration is regulated by controlling the in-breath, the out-breath, the breath retention, and channeling the breath in either or both nostrils. What is the Effect of Pranayama? Breathing comes naturally to us that it is easy to dismiss Pranayama. We breathe all our lives so how could simply regulating that breath bring about so much power? On the human body, according to ancient Indian text and treaties, by regulating respiration, one can create stillness of the mind, balance the body (if you are irritable, you'll be calmed down...if you are melancholy, you will be energized) and put the entire human system at equilibrium. On the esoteric realm, particularly on the more advanced form of breath retention called kumbhaka, this pranayama pushes Apana up to meet Prana at Agni and generates heat to awaken the Kundalini. The Kundalini Shakti goes into the central nadi, Sushumna, and starts its way up from the Muladhara Chakra to the Sahasrara Chakra. The yogi develops psychic powers once this happens. I haven't read this part from any Indian text, but from my own personal experience, Pranayama can also produce the Superman-Effect. You generate almost superhuman stamina and tap into a rich and seemingly unfathomable source of energy which consequently wards off disease and keeps the health optimized. Most articles about Pranayama caution that this should only be practised with a Pranayama teacher because of its dire consequence. An analogy is presented that to the unprepared, Pranayama is like plugging a 220 volt machine to a high voltage source - it will fry the machine! Again, given my Superman-Effect experience, I personally vouch for that. That's why I've never done it again. It felt like playing with nitro-glycerin - powerful but volatile and explosive. I was lucky that my body was strong enough for my foolhardy adventurism to a half-day of pranayama. Had I been sedentary and unfit, I can't begin to imagine what would have happened to me. But having said all that caution, I would say Pranayama is safe when done moderately at the beginner level - Ujjayi breathing, Anuloma Viloma and Kapalabhati. In fact, I include those three as an integral part of my sequence when conducting a yoga class. Having benefited immensely from Pranayama, I keep it as a lifestyle choice. 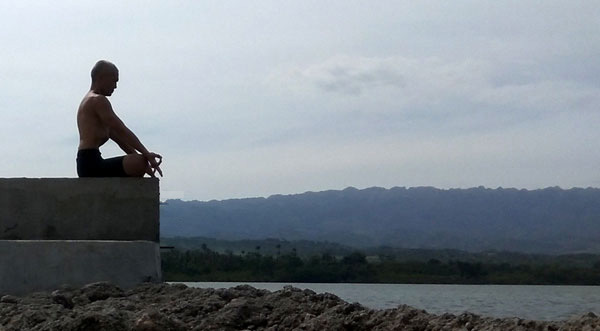 With my daily 2-hour workout at the Moalboal jetty, I devote at least 20 minutes to Pranayama. With fresh and clean air from the sea, I combine asana, kumbhaka, mudra, chakra and bandha to deepen my pranayama practice. Pranayama comes after my asana/calisthenics but before meditation. The sequence is crucial. In Padmasana, I face the water and begin my pranayama. The breathing is compliant to the yogic system of only nose breathing - long thin breath, breathing deep, slow and steady. Lungs are completely inflated on the in-breath, honoring the pause, and completely deflated lungs on the out-breath, ensuring there is no residual air left. Anuloma Viloma with Bahya Kumbhaka - this is similar to #3 but instead of holding the breath on the inhale, the breath is held on the exhale, completely emptying the lungs and then tucking-in the belly and pulling it up (Uddiyana Bandha)...and holding it there (Bahya Kumbhaka). Release the belly first before inhaling back on the same nostril. Kapalabhati - this is a forceful exhalation by using an abdominal push, similar to a sneeze. Even though I never attempted the Superman-Effect again, I continue to practise pranayama with intensity for increased health and to complement my freediving. At my age, I am as strong as a raging locomotive - no ailment of any kind, no medication, no maintenance pill...and I can't remember the last time I've seen the doctor. Bragging aside, I've climbed the tallest peaks in the country, dived down to 18m on a single breath and white-knuckled technical single-tracks on a mountain bike. I'm ripped and my stride has the bounce of spring. That is pranayama. What baffles me is how could something (breath regulation) so powerful, something free of charge and something so readily available and simple, be so ignored? People would rather spend an arm-and-a-leg on hyped-up supplements for something with side-effects or outright fraud! From my humble experience, pranayama is the fountain of youth, the giver of strength, the unfathomable source of energy - and it's all free for the taking! (Aug 3, 2017) Well explained and very appreciative of your writings on this. Personally in noticing my off breathing patterns from a while back and practising pranayama for many reasons and activities... From relaxation-anxiety stress, to mindful breathing promoting digestive and overall functions to utilizing breathing techniques inducing motivation at the gym for endurance and stamina. It's amazingly powerful and rewarding indeed.